Well, at least the Americans had colour cameras. Incidentally, I strongly recommend you check out the Chicago and New York pics. cracking pics, having a wee rummage through the site just now. Some great wee films on there and some of them are in colour. Cool.. well done for spotting the chippy! Some other great photos on here. Where abouts was this ferry? That view looks like it's from "Water Row" on the south side near Govan, looking north toward Partick (railway bridge & arches visible) where the Kelvin meets the Clyde.....that being so, the River Clyde in the above picture would "flow" from left to right. You could be right. That railway bridge you mention doesn't look like that anymore. What park was that pic taken Konstantin? The best picture on the glasgow story site. It was taken from Cambuslang apparently. I'm not to familar with Cambuslang (except the main street) so I'm not sure what the parks called. Just a thought about a possible reason for it - quite a lot of the archive photos will have come from newspaper archives, and newspapers didn't print in colour till fairly recently. Maybe? 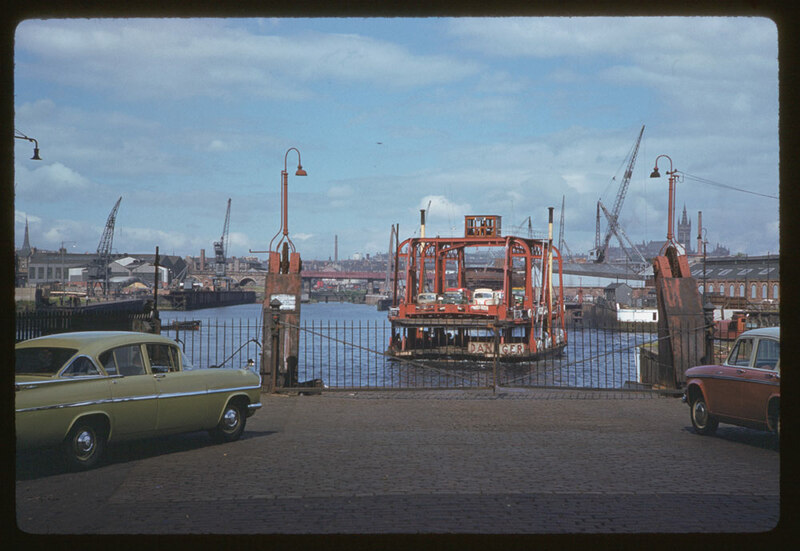 OK, on the back of this thread, I went hunting in Waterstones for a book they used to carry about trams, which was taken from some chap's collection of almost all colour slides. I never bought it when I first saw it a year or two ago, cos it was 25 quid, although I now regret it, since it was a small price to pay for so many unique colour prints of the place in the 50s and 60s. Amazon appear to stock it, if this is indeed the right book - it's called The Twilight Years of the Glasgow Tram by Alastair Turnbull. I've ordered a copy, will let you all know if it appears! Anyways, although Waterstones no longer had a copy, they did have a recently published book called Streets of Glasgow, by Alan Millar. Published by Ian Allen, it's along similar lines, with all colour pics of buses, trams and trolleybuses from various sources. 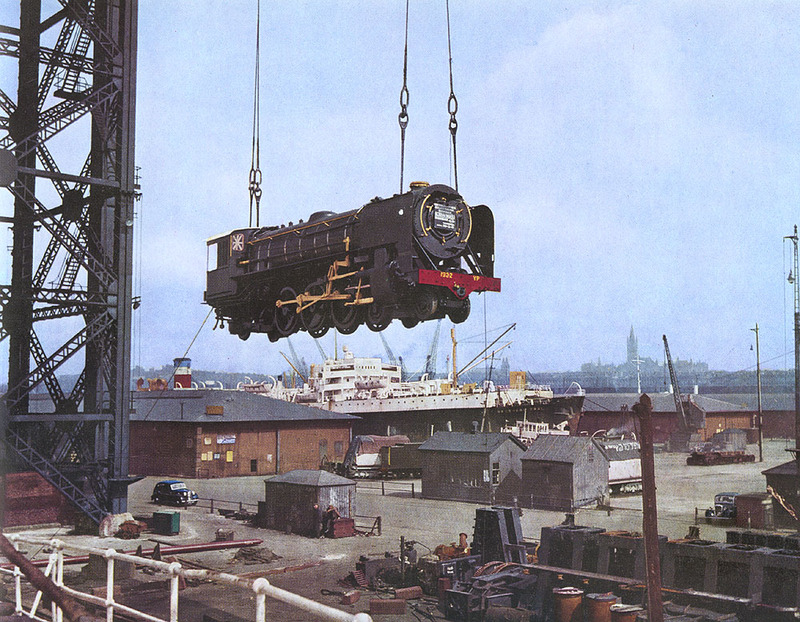 Although written from a transport viewpoint, with lots of technical info on the buses and trams in the pics, it is a fantastic archive, and fits this thread perfectly. These men that I would once have considered quite sad taking pics of such things have preserved the ordinary street scenes that now fascinate me, and even the buses now interest me, although I should never admit in public that I know a Leyland Leopard from a Leyland Atlantean! Ethically, plundering this book to put pics on this site leaves me feeling a wee bit guilty, and site admin may not take too kindly to such wholesale reproductions! But even if they only stay up for a short spell, I like to think it would pay dividends by getting at least a few of you to go out and buy a copy - the scans here are reduced and compressed to keep file size down, so if you like them, go out and buy the book - a mere 14.99 in Waterstones Sauchiehall St, they had about 10 in the Glasgow section yesterday! Waterloo Street Bus Station - no, I didn't know this place ever existed either! This scene was taken in 1966, 5 years before it closed. The site is apparently where Central Exchange is being built now. Union Street, March 1962, with what is now Black's just behind the first bus. Trongate at Glasgow Cross, undated, but obviously pre-1962 since there's a tram or two there! St George's Rd, from Charing Cross, looking north, Undated again, but obviously pre-dates the motorway, which obliterated everything on the right. The ABC cinema on the left is now a snooker club. St Enoch Square, 1959, with the train station still looming on the right. 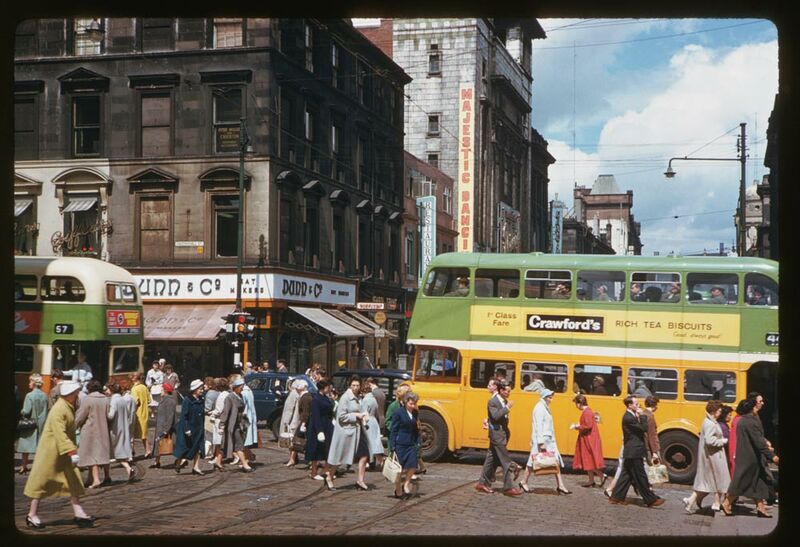 Sauchiehall St in July 1955. The facade of the Gaumont Cinema behind the trams was retained for The Savoy Centre, and Drages store is now River Island, I think. Renfrew St in May 1966. The tenements stand where the Thistle Hotel is now, and the RSAMD is now on the right. In the background is what I think is now called Flemington House or some such thing - I always remember it as home to the Kensitas Coupon gift centre, where loyal smokers of the budget brand could exchange their lives for a set of bathroom scales! North St in February 1970, as the M8 is being excavated. The sooty facade of the Mitchell is in the centre, and if you look really carefully, the walls of the fire-ravaged St Andrew's Halls are behind it, awaiting the library's 70s extension bing built inside. Maxwell St from Clyde St, 1964. St Enoch Station dominates the background. Fury Murray's is now on this street, and I'm sure the bar on the left still has those 60s typfaced signs on the wall! High St at the junction of John Knox St, where the Museum of Religion now stands. The Provand's Lordship is on the left, the Infirmary on the right. Everything else has, I think, been demolished. 30th April 1966, the last day of the trolleybus service pictured.